Situated between Woolacombe and Saunton Sands, Croyde Bay is a beautifully sandy location highly regarded by surfers for its consistent surf. When the tide is out, hang around by the rock pools to see what creatures you can find or you could embark on a walk just up the coast to Baggy Point. The pooch will be able to join you on the beach from October to April or during the summer months you could take them inland to explore the many tracks running through villages in the North Devon AONB. Food & drink nearby: For a refreshing drink visit The Thatch, a pub with character, a great selection of drinks and a beautiful outdoor seating area. For views across Croyde Bay, stop into Baggy’s Surf Café on your way up to Baggy Point. Woolacombe beach is a firm family favourite for its stunning three miles of golden sands stretching along Devon’s north coast. 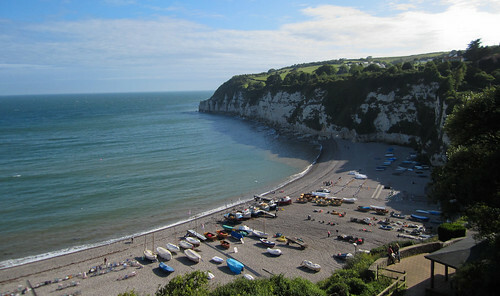 You can sit by the vibrant beach huts and enjoy a BBQ or play any number of games on this enormous stretch of coastline. Patrolled by RNLI lifeguards from Easter to September, it’s the ideal place to get in the water to learn to surf, paddleboard or kayak in safety. Dogs are welcome on the beach – with some restrictions – between April and November. Food & drink nearby: The beach is only a stone’s throw from the Red Barn restaurant, The Captain’s Table is one of Woolacombe’s most popular cafes while the Pavilion Restaurant at the Watersmeet Hotel offers fine cuisine and elevated views of nearby Barricane beach. A quieter option compared to the nearby Woolacombe, the beach’s name is inspired by the exotic sea shells washed thousands of miles from the Caribbean to this small, rocky inlet on the North Devon coast. 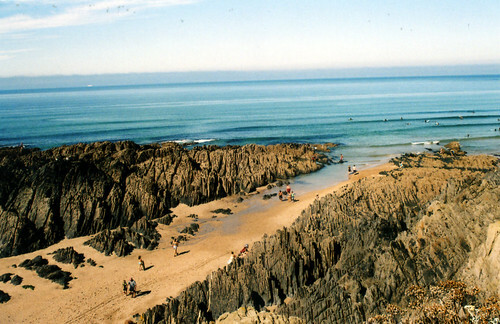 Other than discovering these unusual shells, the beach has a number of thriving rock pools and is popular with surfers. Surrounded by a number of eye-catching rock formations, there are plenty of secluded spots where you can escape the crowds. Food & drink nearby: There’s only one place we really need to mention for this beach and that’s the Barricane Beach Café located right on the beach. It may seem like a rather unassuming shack but its delicious Sri Lankan curries are an absolute must. Even if you’ve not been to this beach in person, there’s a good chance you’ve seen it in one of the many films produced here – including ‘Edge of Tomorrow’ and ‘The Guernsey Literary and Potato Peel Society’ to name just two – or in the video for Robbie Williams’ ‘Angels’. The three-mile expanse is ideal for family activities or dog walking while just behind the beach lies Braunton Burrows, the largest sand dune system in England and home to over 400 unique dune plant species. Food & drink nearby: For consistently good fish and chips try Squires Fish Restaurant while The Corner Bistro serves excellent, authentic French fare. At the end of the picturesque fishing village of the same name is this pebbled beach surrounded by beautiful boats and limestone cliffs. As the cliffs give you natural protection from the wind, you can be sure of a microclimate warmer than many of the other exposed beaches in the county. As a finalist in Channel 4’s Village of the Year competition, Beer itself is well worth exploring while the Jubilee Gardens give a great look down onto the beach and were voted by parents as one of the best picnic spots in the UK. Food & drink nearby: When you need a break from sunbathing walk up the beach until you find the Anchor Inn for a tasty meal and a pint, all of which can be enjoyed from the beer garden out front with its amazing views over the beach. If you don’t fancy walking back up the beach then Ducky’s is situated right amongst the pebbles. 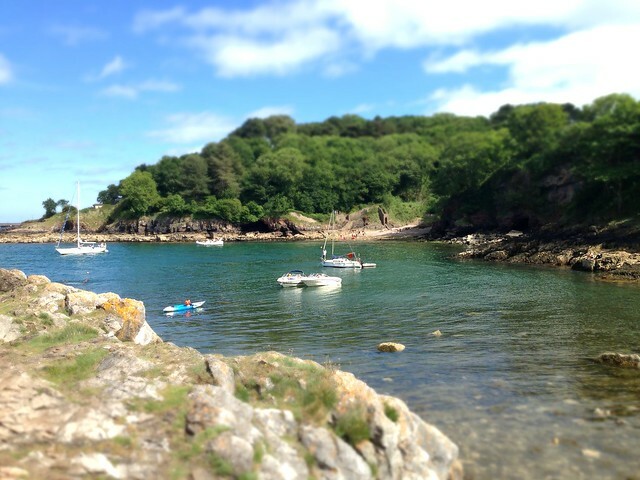 Nestled between Babbacombe and Torquay, the pebbled shores of Anstey’s Cove provides a quaint place to escape while on your break in the English Riviera. With plenty of rocks to clamber over and safe swimming spots, the kids can run free as you catch a few moments of peace. Relax in your deckchair and admire the same glistening waters enjoyed by Agatha Christie during a romantic picnic with a man whose name she would later use in one of her novels. Food & drink nearby: If you feel peckish, visit the nearby Anstey’s Cove Café for a sandwich or something sweet – you can also hire a kayak from here if you fancy getting out onto the blue waters. 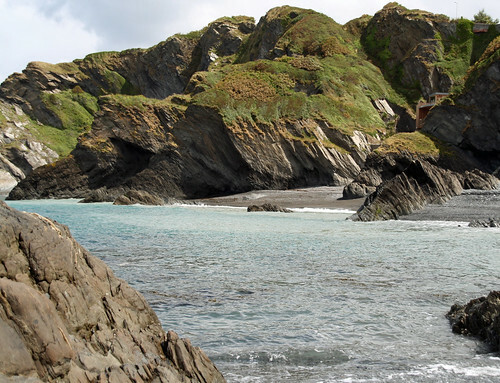 Fishcombe Cove is a small, shingled beach surrounded by rocks and cliffs in Brixham. Sheltered by towering red cliffs that largely reduce the impact of the elements, swimming is accessible for all and there’s a good chance you may even be sharing the waters with a seal so keep a keen eye out. This hidden gem is accessed via steep steps from the nearby cark park or from the Battery Gardens. As you descend, drink in the views over the surrounding woodland and the sea below. Food & drink nearby: There’s the Fishcombe Cove Café close by overlooking the cove where you can grab a cold drink and some simple snacks that will keep everyone happy. For picturesque views at a peaceful location, head to East Portlemouth’s collection of sandy coves to soak up the sun and enjoy views of the estuary and across to Salcombe. Whether you’re on Fisherman’s Cove – you can catch a ferry across to the busier beaches of Salcombe from here if you wish – Mill Bay or Smalls Cove, the waters will be shallow and calm so you can wade in without worrying about any rogue waves. Food & drink nearby: The Venus Café will be your nearest option for refuelling before heading back inland to walk the rolling hills around the village. Travelling over to Salcombe on the ferry opens up lots of other eating options. Although the name may be slightly misleading – the beach is actually made up of shingle – the claim that it’s ‘South Devon’s most picturesque beach’ certainly holds water. Located just 15 minutes outside of Dartmouth, surrounding woodland runs right down to the edge of the beach, creating a combination of countryside and coast that few other beaches in the county can boast. There are sand pits, a bathing raft and water sports equipment to hire so you can fully enjoy your day on the beautifully clear seas. Food & drink nearby: The Venus Café will never be more than a few hundred metres away wherever you are on the beach while The Green Dragon pub in Stoke Fleming is just a 15-minute walk up the road. Looking out onto the shallow Bigbury Bay and the iconic Burgh Island, this popular family and surfing beach is deep in the South Hams with easy access to a number of walks towards Thurlestone or South Milton Sands. When the tide is out the beach is enormous and the pooch will be more than happy to roam around the area for hours while you soak up the seemingly never-ending panoramic views. The beach is purposely managed to keep it as untouched as possible and we really hope it stays that way for generations to come. Food & drink nearby: The brightly-coloured Gastrobus is perched just up from the beach and has become a fixture for the area by serving delicious gourmet burgers, exceptional coffee and sumptuous hot dogs. Looking down onto this beach and taking a few pictures from the castle-like walls of Connaught Gardens is something that anyone visiting Sidmouth simply has to do. Take a seat on the walls and admire the fantastic red cliffs, the fenced paths winding through the hills and, of course, the famous white steps snaking down to the sand and shingle beach. Be careful of landing planes however! 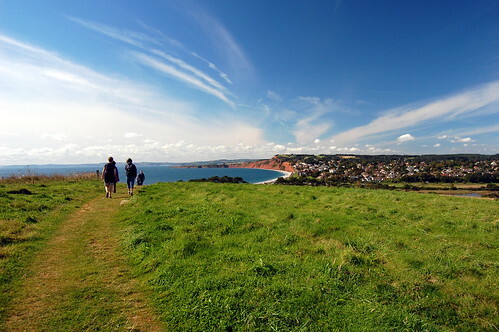 After getting an ample selection of snaps you can take the South West Coast Path towards the elegant regency town to explore the main section of the town beach, a larger yet equally awe-inspiring stretch of coastline. Food & drink nearby: In Sidmouth there are numerous options for different types of food. For café eating we recommend The Chattery, for seafood we suggest Neil’s Restaurant and The Anchor Inn is spot on for traditional pub dining. 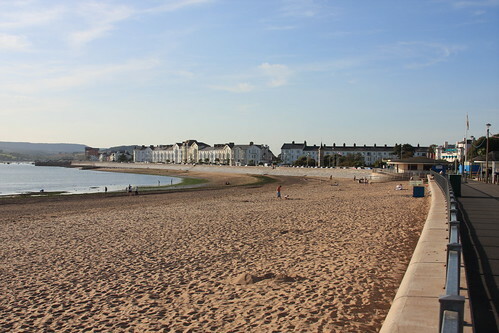 Sitting at the mouth of the River Exe, Exmouth is a traditional seaside town just half an hour drive away from Exeter. 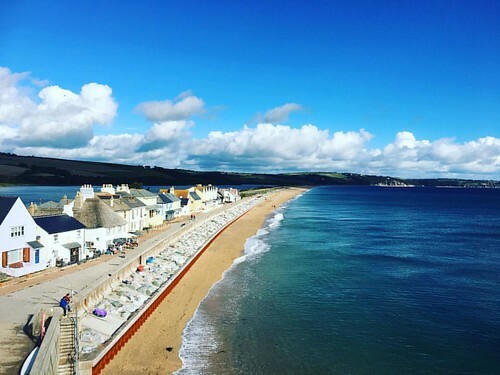 Often described as the gateway to the Jurassic Coast, its beach is also classically British with a promenade situated just behind the golden sands. As it’s such a large beach it won’t typically feels crowded and there is always ample room to do whatever family-oriented activity you like whether that’s a game of beach cricket, flying a kite, or taking the dog for a walk. Food & drink nearby: Taking the water taxi out to the floating River Exe Café is a true Devon bucket list experience while Rockfish has incredible views of the estuary and its entire marine goings on. One of East Devon’s most unspoilt towns is appropriately home to one of the county’s most pristine beaches. Made up of two miles of pebbles, clean bathing water and enormous red cliffs, it is the westernmost section of the Jurassic Coast and an area where you’ll want to have your camera on hand. The beach goes from Littleham Cove to Otterhead with the rocks at Ottermouth providing a rich area for beach-faring wildlife to thrive. Access to the town and its many amenities from the beach is straightforward and quick. Food & drink nearby: A delicious cream tea can be had at the quaint Tea and Tittle Tattle on Fore Street or you can stay on the beach with the Longboat Café. With Slapton Sands on one side and the Slapton Ley National Nature Reserve on the other, the A379 is likely one of the most unusual and picturesque roads you’ll drive down in Devon. Looking out on to Start Bay, this fine shingle beach was the scene of disaster in 1944 as friendly-fire during D-Day preparations led to the deaths of 749 American servicemen. To honour those who lost their lives, a Sherman tank recovered from Start Bay stands at the edge of Torcross car park. Food & drink nearby: Torcross is by no means a large settlement so options are relatively limited but either Start Bay Inn or Seabreeze Café should provide enough to satisfy the appetite. If you’re in Britain’s ocean city – Plymouth – and fancy a beach escape within a short drive then we recommend this beach, along with Wembury. With views into Plymouth Sound and its numerous rocky outcrops, this sheltered cove is particularly pretty under clear skies. On a summer’s day sailboats will be out in force while you paddle in the clear waters and on the odd occasion a larger ship can be seen leaving for or returning from the Spanish port of Santander. If you’re feeling energetic, take a walk along to Fort Bovisand. Food & drink nearby: Restaurants, pubs and café are in abundance if you head back into Plymouth but your closest option for refreshment near Bovisand will be the Cliffedge Café. Carved by hand in the 1820s, this set of four tunnels provide access to a number of secluded beaches and were crucial in Ilfracombe’s transformation into one of Britain’s most attractive coastal resorts. Unlike many of the golden sand beaches on this list, the beauty of these small spots comes from the sheer complexity and scale of its many rugged rock formations. So unique are the rock formations here in fact that the area was voted as the third best beach in the UK for rock pooling by BBC Wildlife Magazine. Food & drink nearby: Head back into Ilfracombe to try an afternoon tea or fried breakfast from The Manor House Café or go to Seventy One to sample a seafood dish like a lobster risotto.